Jane Winton was born October 10, 1905, in Philadelphia, Pa. Not yet 20 years old, she came to Hollywood and got her first role, an uncredited one, in "Three Women" in 1924 for no less than Ernst Lubitsch at Warner Brothers. 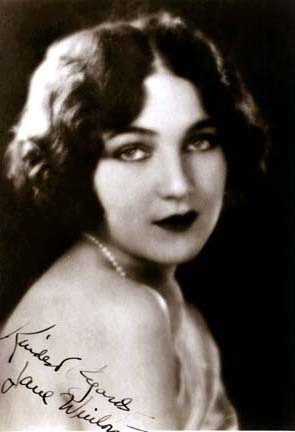 She remained busy throughout the silent era, but typically in secondary roles such as Donna Isobel in John Barrymore's "Don Juan" (1926), Virginia Lee Corbin's straight-laced sister in the low budget "Bare Knees" (1928), as a vampr rivaling Marion Davies for Johnny Mack Brown's affections in "The Fair Co-Ed" (1928), again with Marion Davies as her older sister in "The Patsy" (1928) and small roles in big pictures such as "Sunrise" (1927) and "Hell's Angels" (1930). She didn't skip a beat when sound came in making three pictures in 1929 and five in 1930 before backing off of her acting, making only five more pictures in the next seven years. Instead, as a very accomplished soprano, she focused on an operatic career both in the United States and in Europe. In 1933, she performed with the National Grand Opera Company in "I Pagliacci." She was very popular in England appearing both in opera and on radio. Winton wrote two novels, "Park Avenue Doctor" in 1951, and "Passion Is the Gale" in 1952. She was married three times: in 1927 to screenwriter Charles Kenyon, in 1930 to New York businessman Horace Gumble and in 1935 with Michael T. Gottlieb, a stockbroker and tournament bridge champion to whom she remained married until his death. She maintained residences in Katonah, NY, and Phoenix, AZ. She passed away in 1959 while staying at the Pierre Hotel in New York City.